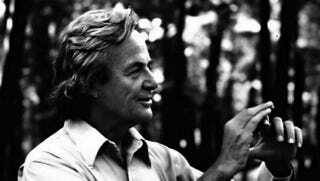 Following a Freedom of Information request, the FBI has just released its records on Richard Feynman. Celebrated as an incredible intellectual, the Nobel prize-wining physicist was also a wonderful speaker, writer and, according to the files, a target which the FBI wanted to out as a communist sympathizer. In all, there are 361 pages pf reports, including notes from background checks as well as interviews with his colleagues, friends and acquaintances. A fair deal is redacted, but if you have some spare time, the document makes for really interesting reading. Clearly, for quite some time, the FBI was unsure what to make of Feynman. "...the appointee's wife was granted a divorce from him because of appointee's constantly working calculus problems in his head as soon as awake, while driving car, sitting in living room, and so forth, and that his one hobby was playing his African drums. His ex-wife reportedly testified that on several occasions when she unwittingly disturbed either his calculus or his drums he flew into a violent rage, during which time he attacked her, threw pieces of bric-a-brac about and smashed the furniture."